Dharamsala is famed as the holy residence of the Dalai Lama and houses the Tibetan monk in exile. 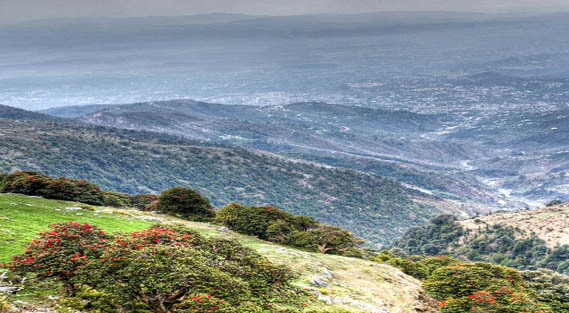 Dharamsala is located in Kangra district at a distance of 18km fro Kangra City. The city is distinctively separated as upper and lower divisions with different altitudes. The lower division is the Dharamsala town itself whereas the upper division is popularly known as Mcleodganj. This is situated on the upper hilly stretch of land of Kangra Valley which is placed just against the picturesque scene of Dhauladhar ranges. Being a Tibetan hub, Dharamsala is considered to be one of the best places to learn and explore Buddhism and Tibetan Culture. Nestled in the lap of the majestic Himalayan mountain range of Dharamshala lies a quaint little cricket stadium. Located at the height of 1,457 meters above sea level, it is one of the highest sports grounds in the world. Visiting a cricket stadium while in Dharamshala may sound like a strange thing to add to one?s itinerary, but the magnificent natural backdrop and the cool winds constantly drifting across the grounds is what makes a trip to HPCA Stadium (as it is also known) worth it. Indigo skies, an eternal stream of the fresh mountain breeze, and the vast expanse of lush green field offers a sensory experience like no other. With a view comparable to the Adelaide Oval or Newlands, this stadium competes with the best in terms of its magnificence. Operated under the auspices of Himachal Pradesh Cricket Association, this beautiful stadium situated amidst the Dhauladhar mountain range in Kangra valley often serves as the practice ground for the Indian Cricket Team, Himachal Pradesh state-level cricket team, as well as Indian Premier League (IPL) team Kings XI Punjab. It has several modern-day amenities for hosting national and international level cricket matches, with the capacity to seat a crowd of approximately 23,000. The atmosphere is fused with a serene Tibetan aura, as seen in the architectural style of the main stand. This would be an expected scenario, considering the stadium has been set up in Dharamshala, the Indian home of Dalai Lama. Perhaps the best part of attending a match at this stadium would be that there is no fence in front of the seating area, providing an unobstructed view of the match. The administration is polite, and the area is quite well-maintained, which makes for a pleasant, hassle-free visit. A constant internal battle is what will tear you apart ? shall I look at the mountains or the match? If you are simply visiting the attraction as part of an extended tour, you are in luck! The stadium is open for tourists even when no matches are scheduled, so do make sure to stop by and soak in the beauty. This neo-gothic church was built in 1852 and is one of the most important churches in Himachal Pradesh. Located near Dharamshala and on the way to Mcleodganj, this church was built in dedication to John the Baptist. It is the oldest built structure of Dharamsala. This church was built in dense woods that is why it is famous as 'St. John in the Wilderness'. It is also the final resting place of Lord Ergin, one of the governor generals and also a viceroy of India during the British Raj. This church should not be confused with the church of the same name located in Nainital, Uttarakhand. A not so easy to find monastery, unless a driver is willing for the same. A serene monastery of holiness. Dal lake is 11 km from lower Dharamsala and lies in between hills and deodar trees. This is a starting point for trekking and excursion, which is covered around the lake to make the walk memorable. Small Shiva Temple is also situated on the banks of this lake. A lively fair is held here every September annually. Triund is a 9-km trek away from Mcleodganj. It is situated at a great height and provides a mesmerizing view of the Moon Peak-Indera Pass. This is an ideal spot for picnics and the clean and pristine environment will surely rejuvenate your senses. Legends speak of a time when evil spirits landed the mountains and harassed the Gods. The gods decided to vanish them, directed by Lord Shiva. All the powers of the different Gods were focused and a huge flame rose from the base of the Earth. From the flame, a girl took birth, now known to be Sita or Parvati. Sati's tongue fell at Jwalaji from about 610 meters above the sea level and the goddess is manifest as tiny flame that burns flawless blue through fissures in the age-old rock. Even the Pandavas are regarded to have visited this sacred place. This is the place where the Dalai Lama resides. This complex has a monastery, various stupas and temples, bookstore and a cafe???? which will attract devotees from all over the world and serve tourists as well. Except for Dalai Lama's residence, every other part of the complex is open for tourists. If lucky, one can even get to meet His Holiness. The Kangra Museum is dedicated to the brilliant marvels of Tibetan and Buddhist artwork and their rich history. Its is situated near the bus station of Dharamshala. Among the variety of its precious collectibles are jewelry, rare coin memorabilia, paintings, sculptures and pottery. The essence of tribal culture is beautifully reflected in the exquisite pieces of art on their culture. Located 5 kms away from the town of Dharamsala in Khaniyara, at the foothills of Dhauladhar, Aghanjar Mahadev Temple is dedicated to Lord Shiva. Believed to have been built around 500 years ago, the temple is nestled amidst bounteous forests and emerald mountain peaks. Other than the idyllic setting, a tiny cascading waterfall accentuates the beauty of the shrine. A small cave near the temple houses a shivalinga and has been marked as a revered spot of worship. Besides the pilgrims, the temple also attracts tourists in hordes owing to its serenity and tranquility. Perched at a little height, the temple can be reached through a stone paved pathway. Some 50 steps below the temple is tiny stream of water flowing which is often used as a picturesque picnic spot. The scenic beauty of this tiny place makes it an ideal spot for nature enthusiasts and photography buffs in addition to the Shiva devotees. Situated 32 kms from Kangra in Dharamsala on the Nagrota- Surian Link Road, Masroor Rock Cut Temple is an archaeological site which is currently in ruins. The complex is a combination of 15 rock cut temples designed in the Indo- Aryan style of architecture, believed to have been built in the 8th century (as per relics). Dedicated to the Hindu gods Shiva, Vishnu, Devi and Saura, the complex faces northeast, towards the Dhauladhar range. Currently under study, experts suggest that the edifice was a part of an elaborate plan of further construction which has been left incomplete. Most of the complex has been damaged, mostly due to earthquakes. The temples have been carved out of a single monolithic rock in Nagara style, with a Shikara. The complex has three entrances at present however, evidently a fourth entrance has been left incomplete. The architecture is inspired by Hindu texts- it has a sacred pool of water, the entire construction is symmetric and is laid out in a square. The main temple with a square sanctum occupies the centre place whereas the other tiny temples surround it in a mandala pattern. The intricate carvings in the interiors depict teachings from the Vedic period. Situated on the top of a rocky hill and surrounded by picturesque Dhauladhar mountains, the mesmerising place is thronged by devotees and tourists alike. It is also believed that taking a dip in the holy waters of the tank can cleanse your soul from the sins. War Memorial is situated in the pine forests near Dharamshala town and the journey itself to this place is totally worth it. There is the beautiful GPG College which was made during British Era. This is the memorial which has been made at the entrance point to Dharamsala in the memory of those who fought for saving our motherland. The smallest tea region of India, Dharamshala has beautifully lined and organized tea gardens across the Kangra Valley. It is known for its good quality tea and is available for purchase in many shops across Dharamshala and Mcleodganj. The Bhagsu Waterfall is perhaps the most famous tourist spot that is located in Dharamshala and attracts tourists from all across the country who wish to revel in the glories of nature and spend some quiet moments in peace and serenity. The Bhagsunag Waterfall is located on the main road which connects Mcleodganj and Dharamshala and is an ideal location for picnicking with family and loved ones. The waterfall starts at the base of the Dhauladhar Valley, which is also considered to be a religious spot. Before cascading down, the stream also passes through the famous Bhagsunath Temple. In fact, the Bhagsunath Temple is located just half a kilometre away from the waterfall, and tourists and devotees prefer to visit the two places in combination while on a tour of Mcleodganj. The Bhagsu Fall reaches the peak of its glory and majesty during the monsoon season when the water falls from a height of around 30 feet and looks captivating and breathtakingly beautiful. The cafes and coffee houses nearby serve lip-smacking food and light refreshments, and tourists especially love to sit down and enjoy a cup of coffee, while viewing the gorgeous waterfall and listening to the sounds that the cascading water creates. Bathing in the waterfall is also possible, but the water is freezing at times for the normal human body to handle. The trek that leads up to the waterfall is yet another unparalleled experience, and the variety of joys and adventures that the Bhagsunag Waterfall offers to visitors makes it a much-loved tourist spot among people of all age groups. Dalai Lama, the Tibetan spiritual leader, is believed to have his abode in Namgyal Monastery which is also the largest Tibetan temple. The foundation of the monastery was laid down in the 16th century by the second Dalai Lama and was set up for the monks to help Dalai Lama in religious affairs. The monks residing here in the monastery carry out practices for the well-being of Tibet and work as a centre of learning and meditation on the Buddhist philosophical exposition. The serenity and ambience that this place creates in the minds of its visitors are enough to attract even those who are not inclined towards this religion. It is truly a beauty and a must-visit. After the Red Chinese attacked Tibet in 1959, the 14th Dalai Lama and thousands of Namgyal monks escaped to the countries of Nepal, India, and Bhutan which led to the establishment of Namgyal Monastery in India. The monastery was first built in the year 1575 by 3rd Dalai Lama in Tibet which was then moved to Mcleod ganj after the Tibetan revolts in 1959. At present, there are nearly 200 monks in the monastery who work towards protecting the practices, skills, and traditions of the monastery. The study of the languages Tibetan and English, texts of Sutra and Tantra, Buddhist philosophy, sand mandalas, ritual chanting, and dances are all included in the study of Buddhism. There are different ventures or institutes which organizes treks here, you will be accompanied with well experienced guides and trekking experts. Triund is one of the trekking hills nearby Mcleodganj for a short trek. One can also trek across Minikiani Pass to reach Chamba. Surrounded by lovely pools and lush greenery, the Bhagsunath Temple is a shrine of great importance that is located about 3 kilometers from Mcleodganj. Also popularly known as Bhagsunag Temple, the temple is one of the oldest ancient temples that can be found in Mcleodganj. The majestic temple was built by King Bhagsu in the dedication of Lord Shiva and the local deity Bhagsu Nag and is situated at the height of 1770 meters above the sea level. The temple attracts a huge number of devotees and tourists throughout the year, who visit it to experience tranquillity and peace in the midst of nature's beauty. With a legend it owes its existence to, a waterfall nearby and many shacks and cafes around; this religious centre has an air of spirituality about it, flattering sceneries around, and much of vibrancy and colour surrounding it. Thus, it tends to be both: a significant place of worship and spirituality and at the same time, one of the most popular and visited spots in the area. The two pools around the Bhagsunath Temple are believed to be sacred and are considered to contain miraculous powers of healing. This is perhaps why the temple is highly respected by the Hindus and the Gorkha community. The grand temple is also surrounded by major tourist attractions, such as the Dal Lake and the Kotwali Bazaar. In fact, the Bhagsunath Temple is situated on the way to the famous Bhagsunag Waterfalls, and thus tourists make it a point to stop by at the temple and seek the blessings of the Almighty before they proceed further on their journey. This museum is located inside the Tsuglagkhang complex and has a collection of brilliant forms of Tibetan art, which includes history documents, pottery, handicrafts, paintings etc. It provides an insight into Tibetan culture and also the various struggles faced by them lately. The structure of the Tibet Museum is influenced by Tibetan architecture which is unique and innovative. Replete with Tibetan culture, Dalai Lama Temple Complex also known as Tsuglakhang Temple is a politico- religious centre in Dharamsala. Ideal for peaceful meditation and religious rumination, the temple is full of lamas at all points of the day chanting on prayer wheels or beads. The temple is in close vicinity to the abode of Dalai Lama and is frequently visited by him to preach and conduct prayer meets. Popular for its beautiful setting, the temple complex has become a revered pilgrimage site for the Buddhists. In addition to this, the peaceful environs and ataraxy attracts tourists from all over the world. The gigantic complex houses massive statues of Avaloktwshwara, Pamasambhava and several other Buddhist monks. The main attraction of the temple is the enormous idol of Buddha sitting on an elevated pedestal. The chief prayer wheel is also located here, at the centre of the temple which is plated in gold and has chants of ‘Om Mani Padme Hum’. Pilgrims walk around the pedestal to pay homage and rotate the prayer wheel. It is believed that by rotating the wheel, the merit is multiplied and the devotees are blessed enormously. The large hall adjacent to it accommodates thousands of people to meditate and spend a few moments of quietude. There are also a few tiny shops within the premises which sell books on religion, peace, meditation, nirvana and the like; in addition to little souvenirs and knick- knacks. Calmly hushed between the idyllic mountain peaks, the temple offers solitude and serenity like no place else.